Carte de la Suisse ou Helvetie. 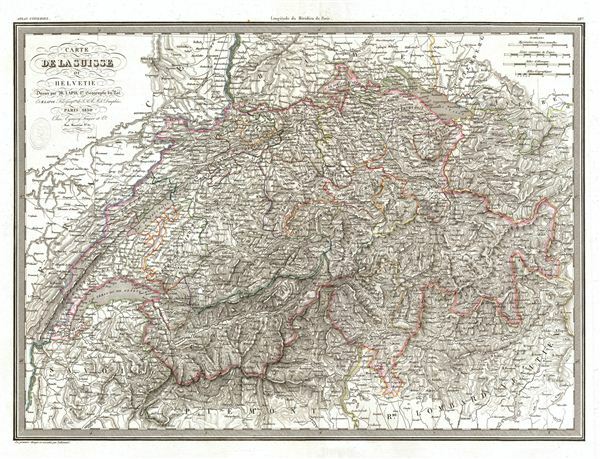 A fine first edition example of M. Lapie's 1830 map of Switzerland. Centered on the country of Switzerland, this map also includes parts of adjacent France, Germany, and Italy. Lapie's map offers fine detail throughout with elevation rendered by hachure and political boundaries demarcated with outline hand color. Switzerland at this time was undergoing a rapid social and economic change known as the Regeneration Movement. Following the French July Revolution in 1830 the Swiss began assemble and call for fair representation and new cantonal constitutions. Many of the cantons subsequently established representative governments and instituted freedom of the press and trade. This map was engraved by Armand Joseph Lallemand as plate no. 28 in the first edition of M. Lapie's important Atlas Universel. This map, like all maps from the Atlas Universel features an embossed stamp from the Lapie firm. Rumsey 2174.028. Phillips (Atlases) 754, 765.